Every year, it seems, there’s a rush to sell me new pixels. My DSLR camera could have even MORE megapixels. My 4K TV could be 8K. Bigger, faster, more… digital stuff. So you can’t blame me for being just a little underwhelmed by all the PR and hyperbuzz around the latest new wireless innovation Five Gee. OK, it’s really called 5G, but I like calling it GEE (as in Gee Wiz) just to make it clear how completely uninterested in it I am. 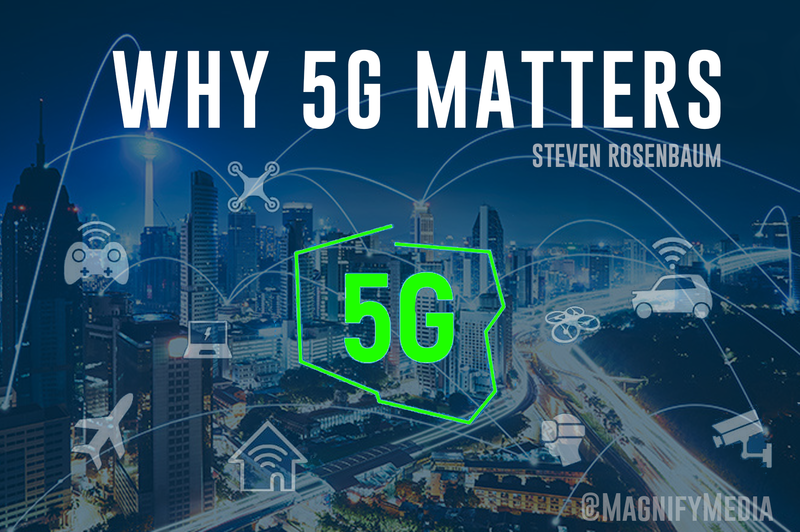 The only thing is, this time we might actually want to spend a minute and learn what 5G is — because if the rollout can proceed without getting screwed up by the marketing folks, it might just be pretty important. Even, dare I say it, a game-changer. So we’ll do this in steps. First, what 5G actually is, and why it’s in danger of making the New Coke fiasco look like small potatoes. When it is fully deployed, 5G will put wireless bandwidth in direct competition with the old fiber and coax internet delivery. So, what is it? The term 5G stands for fifth generation. Adopted by the wireless industry in 2017, 5G supports more than phones. It is the backbone for IOT, the internet of things. The 5G speeds, both up and down, are 100 times faster than 4G LTE. That’s damned fast. Unlike Bluetooth, which is just for short hops of connectivity, 5G will allow connected cars to connect and communicate reliably. Think of it like a fast, always-on, network to connect devices. But not so fast. 5G needs lots of nodes, so that means more towers — tiny ones, but lots of them. So every lamppost and street sign is a candidate for a 5G node, and every 550 yards or so will need a new mini-tower. So rural 5G isn’t going to be coming anytime soon. The tech is solid, and the rollout was planned. And then AT&T makes a mess of things. It all started when AT&T decided to rebrand its current LTE service as “5G E” for evolution. No matter that it’s not running on the 5G standard. The “E” service is a marketing trick, but it confused the market almost overnight. And AT&T's John Donovan was hardly repentant. T-Mobile Chief Technology Officer Neville Ray said AT&T's 5G network was all show and no substance. “They even have plans to show a 5G network indicator for LTE on consumers’ devices to hide the fact that actual 5G will be scarce, duping customers into thinking they’re getting something they’re not,” said Ray. Those are fighting words. So far, AT&T isn’t backing down. But let’s face it: Tech rollouts are always messy, and when you put a cutthroat marketing battle in the mix, things are going to get ugly. Still the positive thing is that 5G — when it’s built — is going to create a mesh of connections for devices and will replace your home WiFi connected devices with easy, fast, and hopefully affordable connectivity. 5G should be fantastic — if you can tolerate the wait.